Presumably, as your are here checking out DanceHouse’s blog, you have some interest in attending Under the Skin, yes? Still seats available, and if you’d like to hear Wen Wei talk about it a bit more (plus hear from the lovely and talented Scott Augustine and Karissa Barry), tune in to North x Northwest tomorrow on CBC 690 AM at about 7:30 AM. See you there, maybe? Say hi, we wear nametags for that very purpose! VIDF continues until March 19–have we mentioned that in addition to some spectacular ticketed shows, there are lots and lots of free things happening. Go forth, and look at their lovely website for more thoughts about what to see. 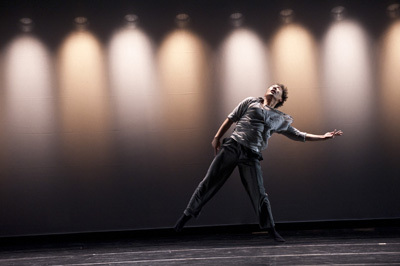 At the Shadbolt Centre until March 12, SiNS (WHAT IS WITH THIS RANDOM CAPITALIZATION, DaNCe coMPaNies?) Dance perform the work of Vancouver choreographer Daelik in a modern morality play set in a dystopian near future. Tix and info @ www.shadboltcentre.com. Photo of Under the Skin by Donald Lee. ~ by DanceHouse on March 11, 2011.